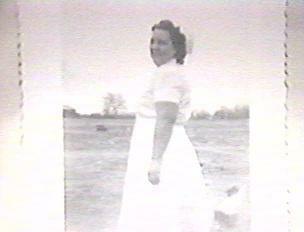 Mary Edna Nix was born August 24, 1918 in Middlelothein, Texas. Her parents were John Thadeous Columbus Nix and Emily (Emma) Jane Lemmon. John worked for the railroad so Marys early years were spent traveling, they never stayed in any one place long enough for her to get much education and back then it wasn't felt that girls needed to be educated. Although she did manage to make it thru the 8th grade. 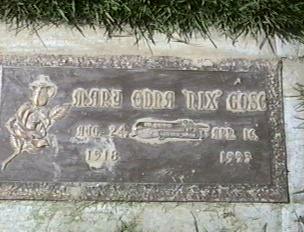 In 1936 she met Jess Willard Gose and married him after a very short courtship. On March 30, 1936 they were married in Hot Springs New Mexico, now known as Truth or Consequences. When Jess left for the Navy he gave the family car to his brother Clyde Odell, and had his checks sent home to his mother Mary Belle, he left Mary and the 2 children at that time with nothing! It was rumored that he was seeing a 16 year old girl down the street, Ima Gene. Mary called her parents after about an 8 mile walk to the nearest phone and they came and got her and brought her to Kennewick, Wa. needless to say she divorced Jess but they remarried in about 1950 and had the last 2 children. When Mary Got to Kennewick, Washington she worked very hard to get her education completed at night school and worked for Fruitland Elementary School in the lunch room during the day. After finishing highschool she worked nights at Our Lady of Lourdes Hospital as a nurses aide and went to college during the day until she got her L.P.N. license. Then she worked at Our Lady of Lourdes in Pasco, Wash. as a nurse and later in Prineville, Ore. at Grizzley Bear Hospital. She raised Jim and Jesse alone, with the help of her parents after she divorced Jess, and after his stroke in 1968 she raised Ruby and I alone also. She also took care of her father after her mother died in 1962 so she really had her hands full with 2 small kids and 2 invalids. And for a short time she took care of her half brother Clarence who had hardening of the arteries but that proved to be to much for her, and she had him institutionalized. Mary was a member of the Church of Christ and attended as much as possible. She took in strays of every sort, from people to cats, dogs and sheep. One time when we were living in Utah, she came across an Indian family whose car had broke down, so she brought them home and helped them get back on their feet. 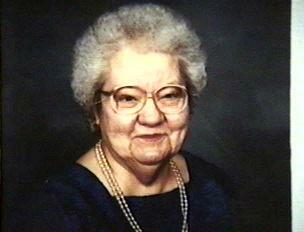 She also raised Robert Aeron Walker for the first 5 years of his life, till his mother Thelma got on her feet. There were several other families that stayed with us thru out the years, she didn't have alot to give but she gave all she had. Baby Gose b. 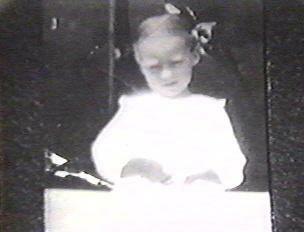 1940 died after a few hours and is buried in Tucumcarri, New Mexico under what is now a freeway. Mary was forced to sell the property in 1976 and was afraid she'd have to pay alot to find and exhume the body so she just didn't mention it and let the freeway go in over her. Mary died April 16, 1993 at Rubys home in Kennewick, Washington of a massive heart attack, and is buried in Kennewick, at Desert Lawn Memorial Cemetery next to Jess and her father.